Fashioned for player comfort, clear powerful tone and easy action, the Dreadnought Jr is reduced to approximately 15/16” of the full Martin 14-fret Dreadnought dimension (14 ¼” width at the lower bout) with an expressive 24” scale length. A solid Sitka spruce top features scalloped ¼” high performance X-bracing with a single asymmetrical tone bar. The back and sides are bookmatched from sapele, and Richlite, an ebony alternative with similar hardness and appearance, is chosen for the fingerboard and bridge. 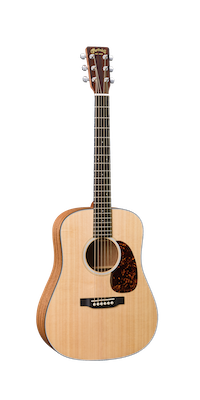 The Dreadnought Junior (aka “D Jr”) comes factory-equipped with Fishman’s Sonitone sound reinforcement system and includes a nylon gig bag.